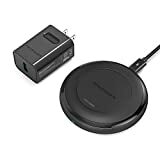 The RAVPower HyperAir Fast Wireless Charger is by far our favorite wireless charging pad. It supports 7.5W and 10W fast wireless charging so every iPhone and Android model are covered. It’s also made of aluminum with a nice rubbery ring on the top to keep devices from sliding around. In other words, it’s absolutely nothing like the cheap chargers you’ll find all over Amazon and in stores. The HyperAir was priced at $50 when it was first released last year, but you can snag one on Amazon right now for $24.